Armor covers every inch of these large Heartless, allowing them to deflect blows from every direction. Instead, aim for the head and knock them down, rendering them vulnerable to further attack. Use Thunder magic to keep them down longer. The Clay Armor is an Emblem Heartless that is found in Kingdom Hearts 358/2 Days. It is one of the bosses in Olympus Coliseum. Roxas is sent to collect hearts at Olympus Coliseum, where Phil has him enter the arena to take out the Clay Armor. While fighting the Clay Armor, Roxas sees a brief memory of Sora fighting a horde of Soldier Heartless at the Coliseum. A Clay Armor has a very large, round body that is almost entirely covered in armor. Its head is very small, pitch-black, and has a jagged mouth, glowing yellow eyes, and short, orange horns. It wears gold boots and large, gold and red gauntlets. The armor around its neck is gold, its breastplate is silver and light green, and the armor on its lower body is brown with a black, zig-zagging line around its abdomen. Its Heartless emblem is in the middle of its belly, just below its breastplate. The Clay Armor's name references the Heartless's ability to use Earth-based attacks. 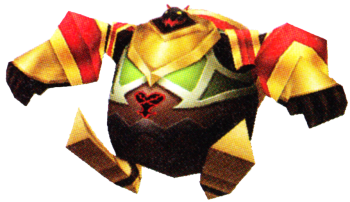 The name also highlights the thick armor plating adorning the Heartless's body. At the start of the battle, jump to avoid the shock wave that the Clay Armor summons when it leaps into the air. It may also cause a wave of energy to ripple across the field in a straight path, this is easily avoidable. Aim for the head of the Clay Armor as its body is invulnerable. Always watch for its movements; when the Clay Armor stops moving, it is about to attack. Should Roxas get hit, he will face a great amount of damage from the Clay Armor's side-to-side slap attack. Should Roxas's HP fall into the "Alarm Zone", do not hesitate to use a Limit Break, though back away once the Clay Armor prepares to attack again. It is recommended have Block, Potions, Ethers, Cure, and Thunder panels equipped. Simply attack until Clay Armor falls and seize the opportunity to deal a slightly greater amount of damage on its head. Concept art of the Clay Armor. This page was last edited on 4 February 2019, at 20:59.